Bourton on the Water is one of my favourite places. A couple of weeks ago I posted about our trip to The Cotswolds and this post is just going to be focusing a little bit more on what we did during our time there. We spent most of the day in this picturesque little village and to be honest I didn’t ever want to leave I loved it that much. I think being there on such a hot day made it extra special as the kids were able to paddle in the river running through it. This is a list of 5 things to do there, most of which we did ourselves but I’ve also included a couple of other options that we didn’t get around to. Visit the motor museum. We have two members of our family who are obsessed with cars but even if you’re not then it’s still worth a visit. There are lots of different rooms to walk through and they are full of vintage cars, bikes and caravans. The caravan section was my favourite part, they were full of vintage goodies. They also had a little courtyard with Cosy Coupes for the kids to drive around in, the paths made up a little circuit that they could drive round and as it was a lovely sunny day this meant we got to relax in the sun for while. 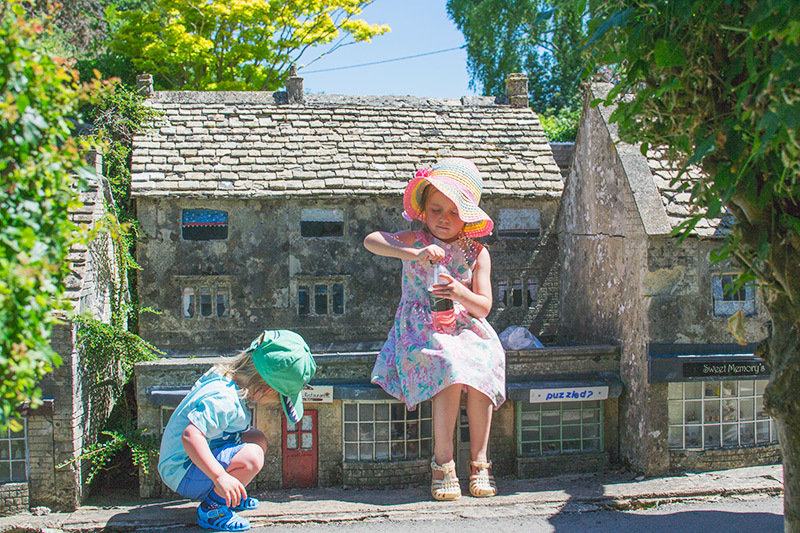 Visit Bourton on the Water Model Village. The kids loved running around the mini village, here they are peeking into the window of the mini Bakery on the Water then the photo below shows the full size one. The next two photos are interesting as you can’t really tell whether they are model village or not, they are in-case you were wondering! Walk along the river. Such a pretty walk no matter what the season. If you wanted to do a longer walk then there is a 4 mile route taking approximately 2 hours, there is also a shorter one and a longer one. Find the info about them here. Have a cream tea in one of the many tea rooms. You will find an abundance of tea rooms in Bourton on the Water, some with outdoor seating overlooking the river. We didn’t actually stop and do this as it was so hot and the kids wanted to be outside running around but it’s definitely on our list for next time. Visit Birdland. We didn’t have time to do this but we walked past it and it looked really fun. A good thing to do if you have kids with you. Visit The Dragonfly Maze. We didn’t have time to do this either but if you click through then you can read all about it. Do the Bloody Bourton Walking Tour. This sounds really fun, it runs on a Friday and Saturday evening and takes you on a tour round the village to hear spooky tales. 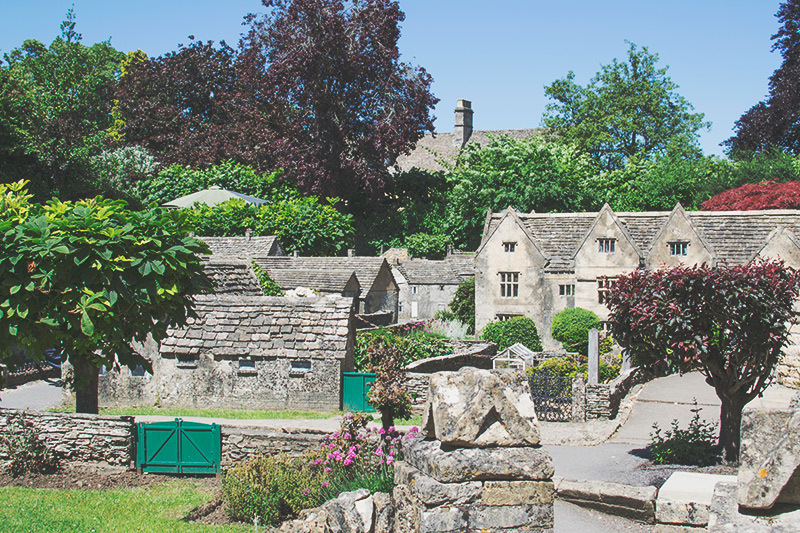 For more information on things to do and places to stay in Bourton click here. And if you are staying in the area then then is no shortage of places to visit. The Cotswolds are full of lovely towns and villages and there are also a number National Trust properties near by. And a big thank you to Boots UK for sending us on this trip, do go take a look at the first post linked at the top of the page for more photos on our time in The Cotswolds as well as some top tips on staying safe in the sun.